Perdido Key FL. 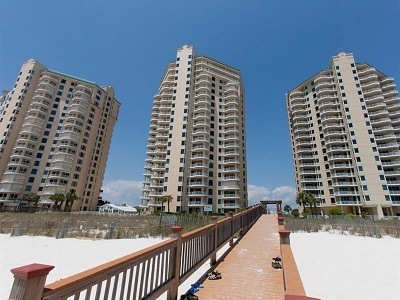 beach front vacation rental home at Beach Colony Resort. This spacious gulf-front residence has amazing views of the Gulf and the popular white-sand beaches. The community amenities features 2 outdoor pools, and 1 indoor-heated pool! The resort also features an exercise facility, tennis courts and more. This beachfront property is completely furnished and can sleep six guests comfortably. - with a king-size bed in Master BR and two queen-size beds in the second bedroom. Both bedrooms are spacious and include HDTV's. Beach Colony gulf-front condominiums in Perdido Key are situated in a gated community, with exceptional amenities that include an indoor pool, outdoor pools, tennis courts, an exercise center and more; these spacious condominium homes overlook the white-sand beaches of the Gulf of Mexico, the complex is a popular family vacation destination.